Carmel Farrell has become a valued member of the Mpower People CIC staff team and we are thrilled that she can bring her knowledge and expertise to the company. 2 years ago, Mpower People CIC met Carmel during our “Mpower Your Digital Skills” Outreach project in Toxteth Library. She was partaking in the Learn My Way scheme which taught Carmel basic IT skills which she has carried onto her current job role. When the Outreach programme ended, Carmel joined us at our new location at MPAC and continued her IT training with us through our Computer Club and was also invited to join our Arts and Crafts club. Before coming to Mpower People CIC, Carmel was unable to use a computer, had no IT skills at all and her confidence using a computer was very low. Joining us and using Learn My Way to improve her skills, Carmel has progressed onto further courses and is now able to use programmes such as Microsoft Word and Excel. She can search the internet safely and can do administrative tasks for Mpower People CIC. From this, she is now able to help others who struggle using computers or any online tools and resources by showing them that anyone can learn. We support people of all ages (our oldest client is 97) and abilities, including people with learning difficulties and disabled people. 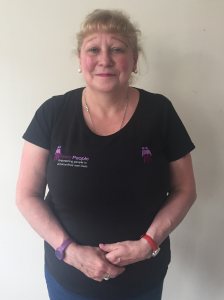 Before her time at Mpower People CIC, Carmel was a support worker for 30 years and thoroughly enjoyed her job, however, due to internal changes to the company, she had to leave her job. This did not discourage her and she has now been able to return to work and as well as working for Mpower People CIC she also uses her kind and patient nature as a volunteer at a local Cat’s Home. Through Mpower People CIC she has been able to build her confidence back up, use her professional skills when working with clients and be able to use her new skills to support clients in areas she struggled with herself. In recognition for the progression she has made and her dedication as a Volunteer for Mpower People CIC, we applied for funding to create a Part-Time Support Worker role and Awards for All funded this post from 8th May 2018. We are extremely grateful to Carmel for everything she does for us and look forward to the year ahead! This entry was posted on Tuesday, May 8th, 2018 at 1:56 pm	and is filed under Events, News. You can follow any responses to this entry through the RSS 2.0 feed. Both comments and pings are currently closed.